The Cats’ House by Bob Walker. Andrews and McMeel, 1996. When Bob Walker and his wife Frances got married, one of their first acts as a couple was to adopt a cat. First came Beauregard. Then, when Beauregard needed company, Benjamin joined the household. That’s how it all began. Bob notes that each day, he and his wife leave their home in the custody of their cat companions. If possession is nine-tenths of the law, then their place is truly the cats’ house. Bob set out to make their home into a place where their cats could live happy, enriched lives and The Cats’ House is the result. Ledges offer the cats an aerial view of rooms and permit them to roam from room to room on a system of walkways that even pass through tunnels in walls. Even if the house hadn’t been so adapted for the cat population, it would still be an unusual home. Bob and Frances collect folk art, concentrating on the arts of Mexico, primarily figures and toys associated with Dias de los Muertos (Days of the Dead). To set off their collection, the interior paints they have chosen for their home include over forty rich, saturated colours. Bob notes that as hot pink is not a colour often used in American homes, they have had to obtain many of the distinctive paint colours in Mexico. Bob offers tips for do-it-yourselfers who might like to follow his example. For instance, don’t set up ledges near curtains! He also details how he keeps his collection safe from clumsy cats by affixing objects to shelves or mounting them in out-of-reach spots. 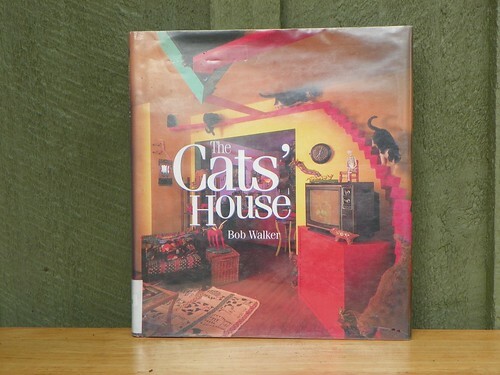 Even if you don’t want to turn your own abode into a Cat House, Bob Walker’s book is a fun read for any cat lover. You can visit The Cat House website here and take a virtual tour. 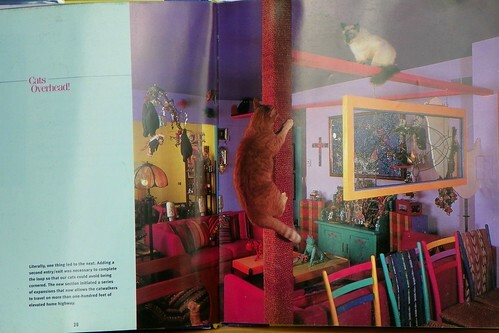 Unrelated to this book, but also of interest to cat lovers is the Cat Ladder blog. Drop by for more entertaining views of cats and walkways. This entry was posted in Non Fiction, Uncategorized and tagged Bob Walker, cat ladder, cat ladder blog, cat lovers book, colourful house, enrichment for cats, entertaining cats, keeping many cats, living with cats, The Cats' House. Bookmark the permalink. This is a amazing web site, would you be interested in doing an interview about just how you created it? If so e-mail me and my friends!